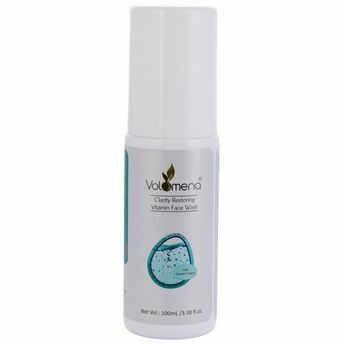 Volamena Clarity Restoring Vitamin Face Wash is a unique face cleaner with an advanced formulation containing alpha and beta hydroxy acids (Glycolic and Salicylic acid) in a stable and safe form which evens skin tones and whiteness skin color. Tea tree oil and Neem extract are effective anti-acne ingredients. The effective Dual action of Anti Acne and Skin Whitening it gently exfoliates and clarifies skin. Enriched with Glycolic acid and Liquorice root extract which lighten dark spots and even out sin color. Aloe vera and Vitamin E beads have moisturizing and healing property. Salicylic acid, Tea tree oil, and Neem leaf extract have an antimicrobial effect which heals acne and pimples. Allantoin and evens Niacin amide promotes cell regeneration and smoothen skin texture.